Nigeria Under-20 national team defeated hosts Senegal 1-0 to clinch the 2015 African Youth Championship on Sunday. A stunning goal from Bernard Bulbwa in the first-half was all that separated both sides after regulation time, the goal a well executed golazo was a master class and left Senegal's Goalkeeper; Ibrahima Sy looking on befuddled with both hands upon his head. The victory makes it a record 7th U20 trophy for the Nigerian Flying Eagles. 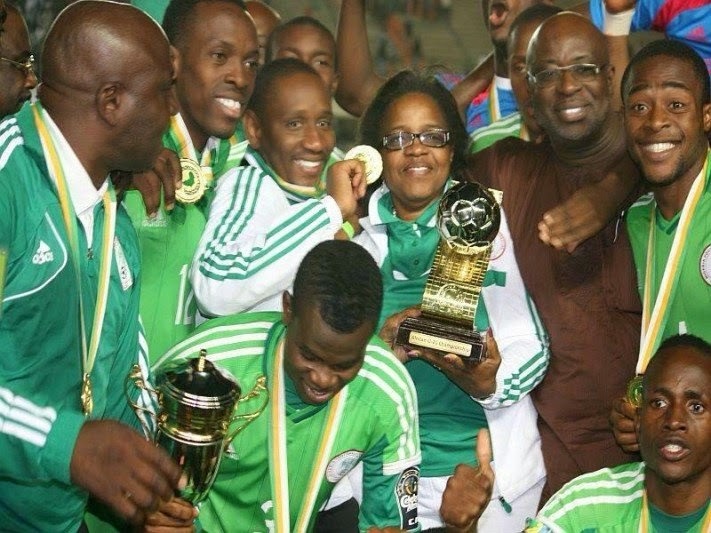 Coach Manu Gaba’s side’s triumph, 32 years after the country’s maiden success, cements her name as the giant of youth football in the continent, but as attention now switches to claiming that elusive world title; the team cannot afford to take its foot off the gas pedal. Moussa Kone was a real threat in the oppositions’ area, but could not keep his 35th-minute shot from 20 yards on target. Goalkeeper Joshua Enaholo raced off his line to deny Eld Hadj Niang, before Kone watched his header come off the post just five minutes to the break. The Young Teranga Lions continued to huff and puff at goal after the break, while Nigeria almost doubled their lead in the 58th minute but substitute Ibrahim Alhassan effort was hacked off the goal-line. Sy saved off Taiwo Awoniyi’s feet in the 75th minute and then pulled off a terrific stop 12 minutes later off Ifeanyi Matthew’s effort which was headed for the back of his net. Ghana defeated Mali 3-1 to claim the third-place playoff earlier in the day. The quartet of Nigeria, Senegal, Ghana and Mali will represent Africa at the Fifa Under-20 World Cup in New Zealand, beginning 30 May through 20 June. Nigeria will now proceed to the Fifa U-20 World Cup as African champions and will face Brazil, Korea DPR and Hungary in the Group Stages. The Flying Eagles will open their campaign against Brazil at the Stadium Taranaki, New Plymouth, on 1 June, with subsequent matches against North Korea and Hungary slated for 4 and 7 June. Runners-up in 1989 (beaten by Portugal in Saudi Arabia) and 2005 (beaten by Argentina in Netherlands) and bronze medalist in 1985, the Flying Eagles will be gunning for a maiden World Youth Championship in New Zealand.